Recently Ada, a Mandarin Learning Assistant has been coming into Onerahi School and teaching students Chinese language and culture. Ada is from Guangdong and is teaching students from different schools in Whangarei for a year. Ada has been teaching students things like how to say, “Ni hao” which is “hi”, “ni hao ma” which is “how are you?”, “wo hen hao” which is “I’m good”, and all sorts of other greetings. It’s great seeing and hearing students talking in Chinese at snack and lunch. Students enjoying the Chinese learning and would like to learn more! Also Room 20 and 21 have been learning how to count to 20 in Chinese, about being polite and how to say classroom instructions in Chinese. Room 21 student Amara says “it’s great for students to be learning about Chinese culture, we have learnt how to count to five and say many different greetings, and a big thanks to Ada for helping with this, you are teaching us a lot”. Many students in Room 20 and 21 would like to learn Addition and subtraction problems, and times table problems in Chinese. Thanks to Ada they have learnt another language. Room 18 has been learning about Chinese customs, traditions, how to say some greetings and how to count to 20. 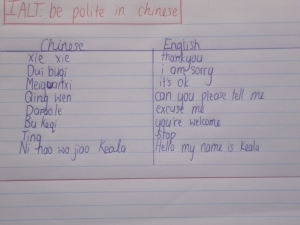 It’s been great for students to learn Chinese, because quite a lot of students have been wanting to learn and to experience Chinese and their culture when they are older. This is some learning that room 20 and 21 have been doing. My name is Stacey and I'm a year 6 and i love animals.My favourite sports are tennis,hockey,Gymnastics and Swimming.I like Onerahi primary school its a great school i also love the teachers at this school. Very well presented Stacey. .looks like your class is learning a lot about Chinese. Thanks Ada for all your time. Andy.